In 2006, Alice and I retired in Frankenmuth and re-joined St. Lorenz Lutheran Church after serving with the LCMS World Missions for over 15 years. We had long term experiences in Hong Kong, Nigeria, South Korea, Indonesia, and short term experiences in various other nations. While serving in Indonesia in the year 2002, we were asked to travel to Papua and conduct a survey for Christian education possibilities. This eastern-most province of Indonesia is located on the western half of the large island of New Guinea. It is known for its wild beauty and some of the most inhospitable terrain on earth. The main spiritual beliefs of the people here include Christianity, Islam, animism and ancestor worship. The population is estimated at about 2.5 million people with a mixture of 275 languages. As a result of that trip, a vision and mission was cast to establish a system of high-quality Christian schools that could meet the needs of under-educated children living in the mountainous villages. Each school would also include a medical clinic to serve the community. Today, that vision has become a reality. In 2014, Alice and I were invited to return to Papua to train and mentor new university graduates who teach and administrate at the two first Papuan Schools of Hope. These are schools where the curriculum is taught through a Christian world-view and the gospel is freely shared with every student every day. Sekolah Papua Harapan is located in the coastal city of Sentani and has an enrollment of 150 students in grades K-7. About one third of them are from the highlands. They live in dormitories at the school. The others are local day students from the city. A second school, Sekolah Lenteria Harapn is located in the mountain village of Mamit and has an enrollment of about 55 students. No roads lead to this village. It is only accessible by airplanes. Bob visited this village during our stay. A new campus to serve 750 students is in the planning stages in Sentani, along with a new clinic. Within the next ten years, plans are to establish thirty similar Christian schools and clinics throughout the province of Papua. This is an opportunity with huge proportions for God’s kingdom. What exactly did we do while we were there? During July and August we helped to lead pre-school training for teachers. Bob taught all physical education classes in grades K-7 as he mentored the new PE teacher. We participated in all the SPH weekly leadership meetings. Alice mentored the principal, the curriculum coordinator, and conducted weekly in-service meetings for the teachers. Bob led weekly teachers’ chapel, using THE STORY materials. We also led devotions in classrooms. We went on campus Prayer Walks, and presented a topic on prayer at the Parent’s meeting. Bob met with the Governor of Papua while he was in Mamit. We also had an unexpected trip to Singapore for surgery and rehab after Alice fell at school and fractured her elbow. Finally, at the end of our five-month stay, we experienced a great farewell party. As the Holy Spirit led we were able to distribute over 185 books; “Keep Me and Keep All” “Keep Me From Evil, Harm and Fear” (Indonesian Translation), Alice’s book; “Under the Eye of the Magpie.” And Randy Frazee’s books’ “The Story.” (Adult and Children’s versions). Thanks so much for your generosity in sending Bob & Alice to minister to us AND also for the Books you sent with them. You have truly Blessed us through their ministry and have equipped us for the ministry. God has blessed us with them. Firstly thank you for your generosity thus the book could be delivered to me and I received it for free. Secondly I will pray for you may, God continue to bless you and use you as a channel of His blessing to bless many more lives. Thirdly and lastly. I hope I can meet you and thank you in person! I am thankful to God who works through his Great people like you all to give money and also share the great Books to us. Thank you so much I want to wish you a wonderful life time and God will bless you now and forever. God graciously answered our prayers for wisdom, safe travels, health, and help for the one hundred seventy-one day adventure. Alice and I thank and praise God for your interest, support, and prayers for our missionary projects. To God Be the Glory! On the first day of December, we arrived at Universitas Pelita Harapan (UPH). Wow, what a wonderful welcome! Rudy, who calls himself our Indonesian son, picked us up at the airport and brought us to UPH. Tuesday morning at chapel I was introduced as having just returned from five months in Papua and afterward had breakfast with James Riady, one of the founders of the university. Alice was still recovering from our long trip and did not attend. James and I talked about the Mamit trip I took a week ago. He was happy to hear about it. He has a personal interest because he has visited this interior highland village. The faculty members at the school in Mamit are graduates of the UPH Teacher’s College. I think Mamit is currently one of his favorite projects. He invited us to return to Papua and open up another interior Papua school. We also received the same encouragement from Wally Wiley to come back to Papua sometime in the future. We wish we had nine lives! Our five months in Papua went fast. The older we get the faster the time flies. The last several months have been full. God has used us in a variety of ways. Every day brought new experiences. Helping Dr. Darrell and Sue Van Luchene teach pre-school training for teachers; teaching P.E. with Sekolah Papua Harapan’s (SPH) new Physical Education teacher, Pak Ricco; meetings with Leadership Team; Alice teaching profession development on Fridays; my Teacher Chapels with “The Story;” giving classroom devotions; going on prayer walks on both campuses; presenting a prayer topic at parent’s meeting; attending the funeral of the brother of Ibu Ika. A special blessing for Alice was her involvement with an international women’s Bible Study group. The ladies pulled her in and welcomed her with abundant love and friendship. We enjoyed several Sunday noon dinners with Wally, Joan, John and Stephanie; and finally a great going away party last Saturday night; we need a break! Being retired is no easy task! Accidents are always a shock. Alice’s fall on uneven flooring at the school resulted in an interruption to our work in Papua. Because of the complexity of her injury, we were advised to travel to Singapore for two surgeries on her elbow. We were gone for two weeks, with a short stay in Jakarta to replace her eye glasses which were also broken in her fall. The entire experience was filled with examples of God’s love as shown through the care, concern, prayers and personal sharing by Christian family and friends around the globe. We thank and praise God for her continuing recovery. Above all, we found living and working in Papua was filled with personal spiritual growth and opportunities to provide encouragement and prayer for mature, dedicated, caring, Indonesian teachers and missionaries. The students attending SPH were typical kids but so appreciative. “We thank you Mr Bob and Mrs. Alice, God Bless you!” were the greetings as we came and left each day. During the time Ricco and I taught physical education I saw a great improvement in his teaching skills. It was amazing to observe. He knows the name of every student attending SPH. His love and care for them is outstanding. He wants to be the best teacher possible. It is just too hot to teach physical education on the upper campus in the afternoons. It is between 90 to 100 degrees Fahrenheit. A new schedule will be produced for the second semester so the cooler mornings can be used. Meeting with the SPH Leadership team was a special privilege. Alice and I did contribute when asked. I think our suggestions were appreciated, accepted, and some were implemented. Alice spent a major portion of her time mentoring Sos, the principal, and Fenna, the curriculum coordinator and teacher trainer. Her input was excellent and greatly valued by both of them. In addition, the teachers were very complimentary about her leadership of Professional Development classes which were held on Friday afternoons. “The Story” has made a spiritual impact on SPH teachers. The Holy Spirit is going to continue to work in their lives through this Bible Study material. 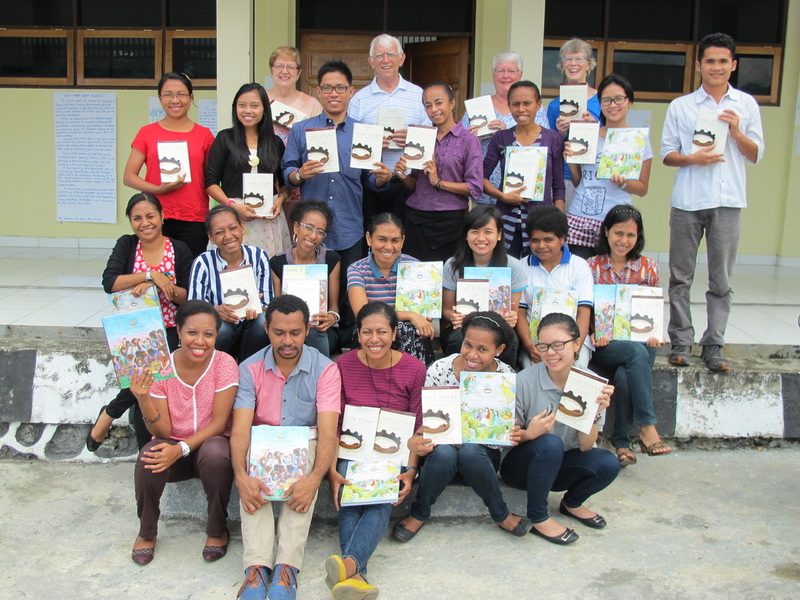 I’m glad I was able to bring these materials to Papua for the yearlong study of scripture. Alice and I both led morning devotions in classrooms toward the end of our time in Papua. Teachers didn’t start asking us soon enough. Head of SPH, Paul, suggested I start leading prayer walks and prayer time with the SPH leadership team on Monday mornings. I think they are going to continue once a month. At the parents meeting I presented a short topic on prayer. Sos translated for me. My Indonesian version of my book wasn’t there yet from Jakarta so they will be given to the parents the next meeting. Ibu Ika has helped in the school clinic for many years. Her brother died and we went to his funeral. His wife and his brother had already died. She and her mother have taken in their eight children. We found out how great and dedicated this Christian lady is. She is an inspiration to us and others. SPH is very fortunate to have her as part of the staff. The faculty took two small boats to an island beach for a day. We had fun swimming, playing beach games, ate some food, and also had a devotion while we were there. Alice didn’t go because of her recent injury. Wally Wiley, founder of SPH, and I went fishing but after five hours we didn’t get but two strikes. I do say it was a very calm and beautiful day on the ocean and I enjoyed being with Wally. Now I guess I need to go back to Papua to go fishing again. While in Papua, Sunday noon dinners became a special family time with Wally and Joan Wiley, Joan’s father John who is 99 years old, and Stephanie an expatriate teacher from the United States. We went out most of the Sundays after church. The conversations were always uplifting. It was very positive to spend time with all of them. For those who remember, we were not to be in Papua the last five months. We were originally to have been in Bali. Bali would have been great too, but the relationships and other experiences in Papua were some of the highlights of our lives and we have had many. I hope you just caught another glimpse of how God can turn disappointments into very positive experiences. For us it becomes another witness how God works. May this Christmas be a time for you and your love ones to celebrate our Lord’s coming for every person on this earth. MERRY CHRISTMAS! Also may God work through each one of us in 2015. HAPPY NEW YEAR! During the school year of 2013-14 the Churches in Frankenmuth, Michigan studied THE STORY – the story of the Bible, God’s great love affair with humanity. THE STORY, video curriculum gave small group Bible studies of all sizes the opportunity to learn, discuss, and apply what they had experienced. Alice and I asked Zondervan Publishers to support a project of bringing this curriculum to Papua. They willingly agreed to supply materials along with extras from St. Lorenz. Also generous financial support from across the country made it possible to bring THE STORY to Sekolah Papua Harapan (Papua School of Hope - SPH). During SPH pre-school teacher training meetings I introduced THE STORY video curriculum and they accepted a schedule of 31 one hour weeks of study on Wednesday afternoons during this coming school year. The teachers will also be coordinating the use of THE STORY Children’s books for classroom devotions and school chapels. This will be done in two schools. SPH is in Sentani, Papua, Indonesia. The second is in the interior mountain village of Mamit. More than 30 teachers and 250 students will be touched by this curriculum. Praise the Lord! The picture includes most of the teachers from the two schools. We are assisting with the education of Mamit Christian teachers and Sentani Christian teachers this coming week with Dr. Darrell and Sue van Luchene who arrived last Friday to join us. We would appreciate your prayers for this special training time.